For when you want your M&Ms and eat your chocolate too! 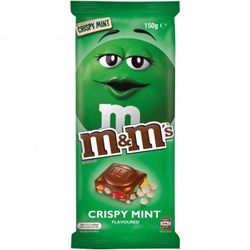 M&Ms Minis plus crispy pieces and mint flavour in smooth milk chocolate. Sugar, Milk Solids, Cocoa Butter, Cocoa Mass, Palm Fat, Rice Crisps (from Wheat and Soy), Emulsifiers (Soy Lecithin, E476), Flavourings, Starch (from Wheat), Glucose Syrup (from Wheat), Vegetable Gum (E414), Colours (E171, E102, E110, E129, E133), Thickener (Dextrin), Salt, Glazing Agent (E903). Contains 85% Milk Chocolate, 11% M&Ms, 3% Rice Crisps. Milk Chocolate contains minimum 25% cocoa solids, 24% Milk solids. Food Colour(s) E110, E129, E102 may have an adverse effect on activity and attention in children. Why can i not find this at any UK supermarkets?